Three tostadas topped with ceviche, cucumber, tomato, onion and cilantro, marinated in a lime/cilantro vinaigrette. Four empanadas two chicken and two beef served with perico relish and green tomatillo sauce. Mexican Sausage and melted cheese served in a sizzling skillet. Chopped grilled shrimp with onions and melted cheese served in a sizzling skillet. Chopped grilled chicken with onions and melted cheese, served in a sizzling skillet. Crispy chips topped with a mix of gilled chicken, applewood bacon and chorizo, topped with refried beans, pico de gallo, sour cream, guacamole and pickled jalapeños. Grilled shrimp with sautéed onions and bell peppers. 12 years and under. Includes unlimited fountain drink refills. $1.50 upcharge for juice or milk refill. 6 · kids’ combo: Ground beef burrito and soft taco. Chicken soup with queso fresco, sour cream, avocado, tortilla strips and pico de gallo. Crispy our tortilla bowl lled with ground beef or shredded chicken, cheese, black beans, lettuce, pico de gallo and sour cream. Crispy our tortilla bowl lled with your choice of grilled chicken or steak, cheese, black beans, lettuce and pico de gallo. Grilled chicken over a bed of shredded lettuce, pico de gallo, cucumbers, avocado slices and cheese. Grilled shrimp, chicken and mushrooms over shredded lettuce, avocado slices, tomatoes and cheese. Chopped romaine lettuce, tomato,onion, avocado, roasted corn, black beans, cucumbers, queso fresco and tortilla strips with a piquin chile raspberry vinaigrette. Mixed greens, strawberries, cucumber, pineapple, avocado, red onion, goat cheese, croutons, dried cranberries and pumpkin seeds in a honey vinaigrette dressing. Most combos are prepared with ground beef and served with Mexican rice and refried beans. One quesadillas with your choice of grilled chicken or steak. Filled with beans, cheese and onions. Served with crema salad. Two quesadillas with shredded beef or chicken and choice of rice or beans. One quesadilla lled with grilled shrimp, beans, onions and melted cheese. Served with crema salad. A flour tortilla filled with grilled chicken and sauteed spinach. Three chicken enchiladas lled with sauteed spinach and topped with a creamy poblano sauce. Served with a side of rice. Three enchiladas lled with shredded chicken, topped with enchilada sauce. Served with rice and a guacamole salad. Three chicken enchiladas topped with a creamy tomatillo sauce and queso fresco. Served with a side of rice. Three corn tortillas, one chicken, one beef and one cheese, topped with three di erent sauces. Served with rice or beans. Four enchiladas, one chicken, one ground beef, one shreded beef and one cheese. Garnished with sour cream, lettuce and pico de gallo. A traditional feast! A hot volcanic stone bowl lled with juicy rib-eye steak, chicken breast, grilled shrimp, poblano peppers, onions, pineapple chunks and a homemade pastor salsa topped with shredded cheese. Served with rice, beans and our tortillas. Grilled pineapple lled with chicken, steak, peppers and onions in al pastor sauce, topped with melted cheese. Served with white rice and our tortillas. Your choice of a 12 oz T-bone steak or a grilled chicken breast topped with shrimp, mushroom, onions and peppers. Drizzled with cheese sauce, served with a side of rice and beans. Grilled 12oz T-bone steak topped with chorizo with cheese sauce. Served with rice and beans. Tender pork cubes in a citrus and Mexican spices marinade. Pork is slowly roasted until golden and is served with pico de gallo, rice, beans and tortillas. Grilled skirt steak served with fried plantains and a guacamole salad. Grilled tender sliced chicken, steak. A mix of chorizo Mexican Sausage, grilled chicken and steak. Grilled tender shrimp and chicken. The perfect mix of beef, chicken, shrimp and pork. Three Tacos in corn tortilla served with your choice of rice or black beans. Your choice of our or corn tortillas lled with fish fillet, topped with red cabbage and a creamy chipotle sauce. Sauteed shrimp in a bisque sauce topped with goat cheese, cilantro, tomato and chile de arbol sauce. Pork confit in an al pastor marinade topped with a pineapple pico de gallo. Pork con t topped with onions, cilantro and a chile de arbol sauce. Grilled chicken with tomato, cilantro, queso fresco, avocado and a chile de arbol sauce. Grilled chicken breast topped with a creamy spinach and bacon sauce. Served with salad and rice. Pan roasted chicken breast stu ed with sautéed vegetables, cheese, creamy chipotle sauce and black beans. Marinated chicken breast topped with grilled mushrooms, onions and our classic cheese and ranchero sauce. Served with rice, beans and tortillas. Sauteed shrimp in garlic mojo sauce, onions, tomato and fresh avocado, served over rice and topped with cilantro. Two our tortillas, fried or soft, with shrimp and crab meat sauteed in a lobster bisque sauce. Drizzled with cheese sauce and sour cream. Served with a side of rice and beans. Sea Bass llet with fresh grilled shrimp, mushrooms, spinach and roasted peppers in white wine sauce. Served with your choice of rice or mashed potatoes. Sea Bass llet and shrimp, scallops topped with a lobster bisque. Served with your choice of rice or mashed potatoes. Three enchiladas lled with shrimp, crabmeat, onion and tomatoes. Topped with cheese sauce and your choice of rice or beans. Pan sautéed pasta with shrimp onions and peppers in a creamy chipotle and roasted corn sauce, topped with cilantro and queso fresco. Salmon llet in a passion habanero glaze garnished with a perico relish. Served with a side of rice and grilled seasonal vegetables. Sliced steak meat, onions, mushrooms and roasted poblano peppers. Drizzled with cheese sauce. One our tortilla filled with pork confit, rice, beans and guacamole dip. Drizzled with cheese sauce and a side of tomatillo sauce. A flour tortilla filled with grilled chicken, chorizo, rice and beans. Finished with cheese sauce and pico de gallo. Two burritos filled with steak or chicken, onions and topped with cheese sauce and sour cream and served with a side of rice and beans. One our tortilla stuffed with grilled chicken, rice, beans and onions. Topped with a spinach and cheese sauce. Flour tortilla filled with grilled steak or chicken, rice, beans and onions. 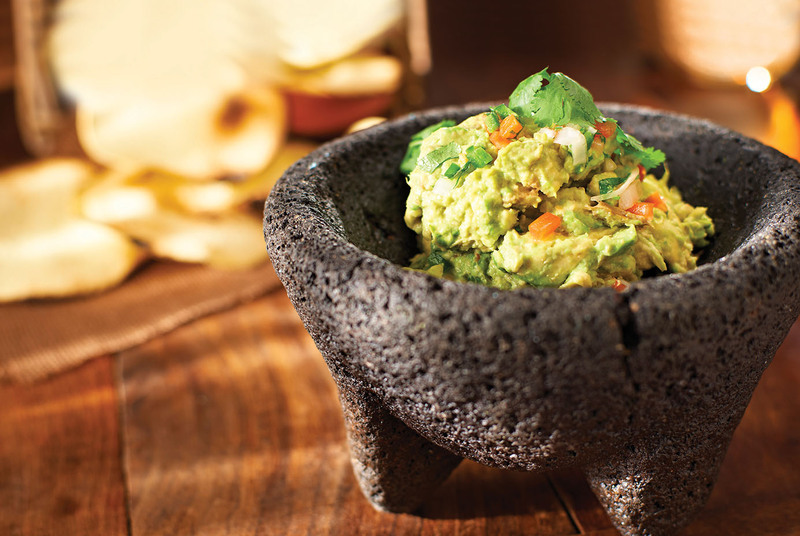 Topped with guacamole dip, pico de gallo and sour cream. Two our tortillas, either filled with shredded beef or chicken, drizzled with cheese sauce, sour cream and served with a side of rice and beans. Flour tortilla filled with grilled chicken, peppers, rice and beans. Drizzled with a creamy chipotle sauce, sour cream and mango pico de gallo. Two burritos, one with chicken and beans and another with beef and beans, topped with burrito sauce, lettuce, pico de gallo, sour cream and cheese. Served with side of rice. A cheese quesadilla, a cheese enchilada and a bean burrito drizzled with cheese sauce. A potato burrito, a mushroom quesadilla and a cheese enchilada. Three corn tortillas with spinach, topped with a roasted poblano sauce. Served with rice. Flour tortilla lled with a mix of sauteed spinach, green zucchini, yellow squash, and mushroom and corn. Two quesadillas lled with mushrooms, onions and peppers. Topped with pico de gallo and cheese. A lunch sized portion of sizzling fajitas with grilled chicken or steak, onions and bell peppers. Served with a side of rice, refried beans, pico de gallo, sour cream and tortillas. One our tortilla lled with grilled chicken and sautéed spinach. Topped with a creamy spinach sauce. Served with rice and beans. One burrito lled with grilled chicken or steak, sautéed onions topped with cheese sauce and sour cream. Served with rice and beans. One beef or chicken burrito with beans topped with lettuce, sour cream, cheese and pico de gallo. Served with a side of rice and beans. Lunch sized burrito lled with grilled chicken, chorizo, rice and beans. Drizzled with cheese sauce, sour cream and pico de gallo. Two chicken enchiladas topped with a creamy tomatillo sauce, cheese and sour cream. Served with rice and beans. Two corn tortillas lled with sauteed spinach and topped with a creamy poblano pepper sauce. Served with rice. Huevos Rancheros $8.50 Two eggs with fried tortillas, ranchero salsa, crema, cheese and avocado. Flour tortilla lled with shredded beef or chicken, either fried or soft, topped with sour cream and cheese sauce. Served with a side of rice and beans. Shredded beef or chicken quesadilla with a side of crema salad and rice. Grilled steak or chicken quesadilla with onions and melted cheese. Served with a side of rice and beans. Breaded steak, avocado spread, queso fresco, tomato, roasted rajas and a chipotle mayo spread on a ciabatta bread. Served with French fries. Corn tortilla chips sautéed with salsa roja, topped with shredded chicken, sour cream and cheese. Corn tortilla chips sautéed with salsa verde, topped with chorizo, sour cream and cheese. A bottle of sangria in a frozen lime margarita. Spicy tequila and elder flower martini. 1800 Silver Tequila, gran gala, fresh lime juice, pomegranate juice. Don Julio Silver, elder flower liquor, strawberry and cucumber. Clear, unaged tequila, normally bottled immediately after distillation. Many connoisseurs prefer this type of tequila for its pure agave avor. Aged in oak barrels at least 60 days and up to 9 months. It tends to be somewhat woody or gold in color and slightly smoother in taste than silver tequila due to the flavor imparted from the oak barrels. Añejo tequilas are aged for one to three years. Añejo’s are often aged in whisky, oak, or cognac barrels, which helps to impart the complex flavor. Due to the longer aging period they typically have a darker color than reposado tequila. Our modern interpretation of a mexican sangria. A fruity concotion that will pair well with any of our main entrees.